Cut Flower Garden. Aquilegia ‘Nora Barlow’. Next spring I shall be adding a couple of other Aquilegias to the Higgledy seed shop but so far I have found it best only to stock seeds of flowers that I am 100% sure are at the top of their game in the cutting garden. Aquileagia ‘Nora Barlow’ has always been a star player. My distant, great Aunti Rohesia Higgledy was of course the infamous cut flower gardener to the medievel royal court of Prince Cutherbert The Unready…whom she knocked off with a Foxglove salad when he refused to acknowledge their love-child Ned Higgledy…(later to be known as ‘Naughty Ned Higgledy The Fruit of Florence’)…well it was Rohesia who produced the forerunner to ‘Nora Barlow’…and it is to her memory that I dedicate my Aquilegia patch in the present day Higgledy Cut Flower Gardens…now located in Cornwall. *First off it is undoubtedly one of the most beautiful flowers known to modern man…or at least modern me. 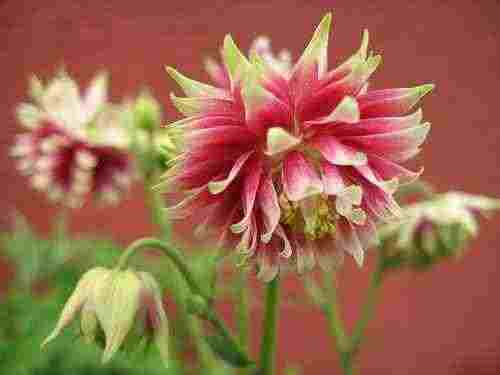 Its pink petals are tipped in white are spherical and most charming. *Lasts ages in the vase. *Flowers from May when blooms are in short supply. 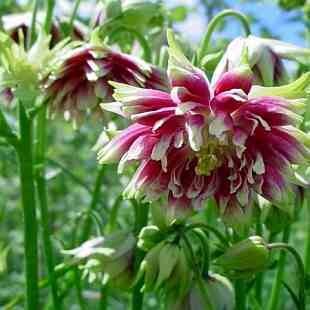 But be warned my chums…that ‘Nora Barlow’ isn’t always the easiest to get going from seed but it is really worth a go. If you fail you can always buy a few plants from the garden centre and pretend you raised them yourself….I won’t tell. Ps If you enjoyed this guide then perhaps you may enjoy, ‘How to grow wallflowers from seed’ or ‘Step One of creating your own cut flower patch‘. Achillea ‘Cerise Queen’. The Hot Biscuit In The 2015 Cut Flower Gardens Of The Chic. Cut Flower Garden: Molucella. Bells of Ireland. This is my second attempt at germinating Nora – and she still doesn’t want to play ball. The seeds are moderately damp, in a warm conservatory , with lots of sunshine, but not a beep out of her . Is it too hot?cold ? wet? Any clues as this one is beating me – and I hate being beaten! I am having such fun with the rest of my Higgledy seeds – but there is always one awkward one, and this is it!